At Delightful Communications we try to live by our vision, mission, and values. More than just guiding words, these core values help us make a difference every day — elevating our work and interaction with both clients and community. 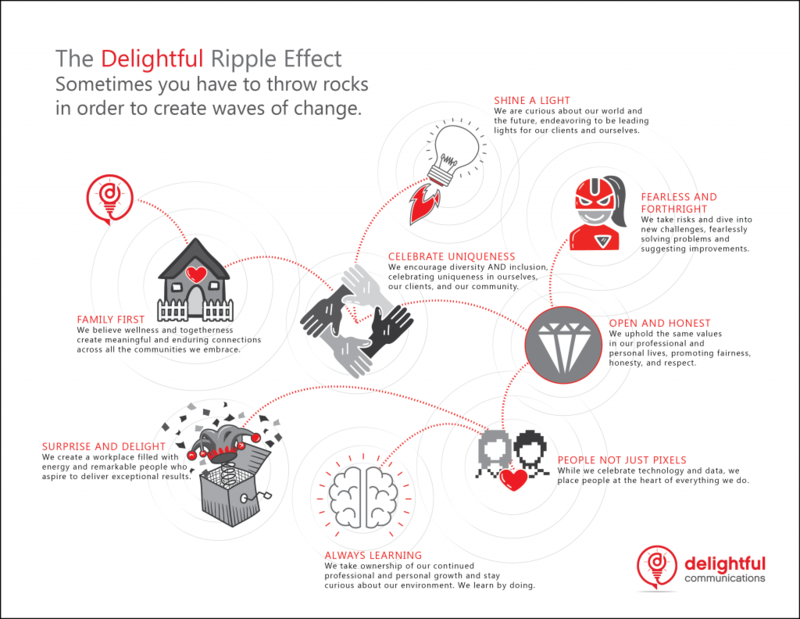 A world where the ripples we create influence, empower, give purpose, delight, and forge success for people and the organizations they care about. To craft dynamic brand experiences that make your message and purpose more discoverable, shareable, and memorable. We truly believe people are our best asset as well as our clients’. While we celebrate technology and data, people should be placed at the heart of everything we do. We always seek the human, emotional connection, both in our work and as we grow as a team. We are curious about the world and our industry and are always eager to learn and improve our skills by constantly working to understand the future and ensure we meet it. We are data-driven torchbearers, highlighting new ideas and opportunities for ourselves and our clients. We create an energizing place to work and aspire to work with remarkable people. We deliver exceptional results and always go the extra mile for ourselves and our clients. We hold each other accountable to high standards and drive each other to constantly progress with our productivity, performance, insight, and character. We promote positive energy and have/are fun. We create worldwide connections for ourselves and our clients that fosters the growth of a global community. We prioritize wellness, flexibility, and togetherness. We embrace direct and productive feedback, holding each other accountable to ensure we grow together. We are willing to take risks and dive into new projects and challenges. We are not afraid to solve problems and suggest improvements inside and out. We believe in straightforward talk that’s candid and open, but sincere and well-meaning. We hold ourselves accountable for diversity AND inclusion. We encourage diversity of thought, experience, race, color, creed, and style. We recognize and appreciate each other and value our individuality and that of our clients’. We uphold the same values in both our professional and personal lives to promote fairness, honesty, and respect for all people. We promote and relish feedback, transparency, and authenticity, and we speak up, even when it is uncomfortable. We live through a “learn by doing” approach because we know that Experience + Feedback makes the best teacher. We take ownership of our development and ask for what we need to increase our abilities. We stay curious and are always on the lookout for new ways of doing things and constantly develop new skills. Delightful Communications is a Modern Marketing & Digital PR agency based in Seattle that helps build brilliant brands for B2C and B2B companies through people, not just pixels. We have proven experience in successfully developing, maintaining, measuring, and optimizing Marketing programs with a human touch for all ranges of companies. Contact us today to discuss your Marketing Strategy and see how Delightful can help your business grow.